Welcome to Tri-County Life Care, Inc.
Tri-County Life Care, Inc. offers the highest quality and most reliable in home wellness care. Since 2001, we have been providing superior service to our clients and have assisted them in achieving their goals. Our over fifty years of combines experience and commitment to excellence have earned us the reputation as the best in the Home Health Care industry. We at Tri-County Life Care, Inc. are family oriented. We firmly believe that your family is an integral part of our team and your recovery process. We will go the extra mile to ensure that your family members understand and feel comfortable with our services. Tri-County Life Care, Inc. believes in providing you with trained, experienced, responsible and professional staff, to satisfy your home health needs. 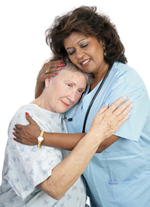 Tri-County Life Care, Inc, ensures peace of mind. Our services are available 24 hours a day, 7 days a week, for your convenience. Providing South Florida's Tri-County Area with the Highest Quality and Most Reliable In-Home Wellness Care. Copyright © 2008 Tri-County Life Care. All Rights Reserved.